Ash attempts to save Pablo in 1982. 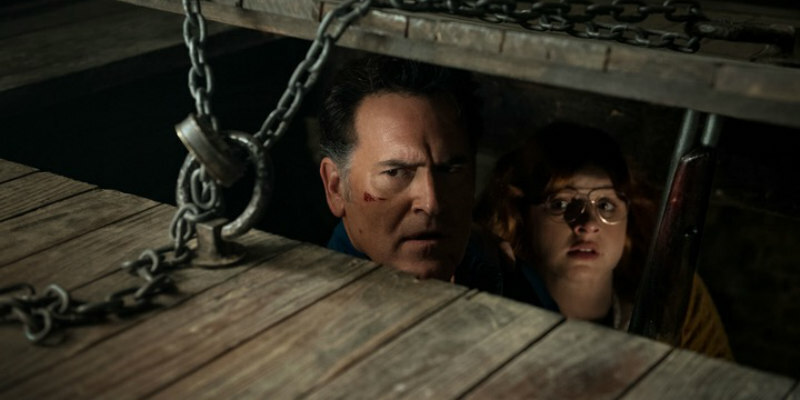 Having travelled back to the cabin in 1982 in a bid to change history and thus save Pablo (Ray Santiago), Ash (Bruce Campbell) found himself battling Henrietta, the deadite found in the cellar in Evil Dead 2, played here by Ted Raimi in a fat suit. The season finale opened with an extended brawl between the pair that saw some nifty effects work as Henrietta morphed into a Harryhausen-esque beast, ultimately beheaded by Ash's trusty chainsaw. Appearing on the scene were Kelly (Dana Delorenzo), Ruby (Lucy Lawless) and er, Ruby, the latter an evil alternate timeline version joined once again by her demon spawn 'children'. A battle between the Rubys ended with the surprise death of the one we've spent two seasons in the company of. Every cloud has a silver lining though, and Pablo came back from the dead. But the reunion celebration was cut short when it turned out Pablo wasn't Pablo at all, but rather Baal (Joel Tobeck). Another extended duel resulted in Ash defeating Baal, bringing Pablo back for real this time, and returning to present day Elk Grove, where a celebration party was held in his honour. In a nod to Return of the Jedi, Ash had a vision of the ghosts of his father Brock (Lee Majors), his sister Cheryl (Ellen Sandweiss) and his old buddy Chet (Ted Raimi). The episode ended with two stingers - evil Ruby seen in the crowd at the party and an unseen young female finding the Necronomicon in the woods. 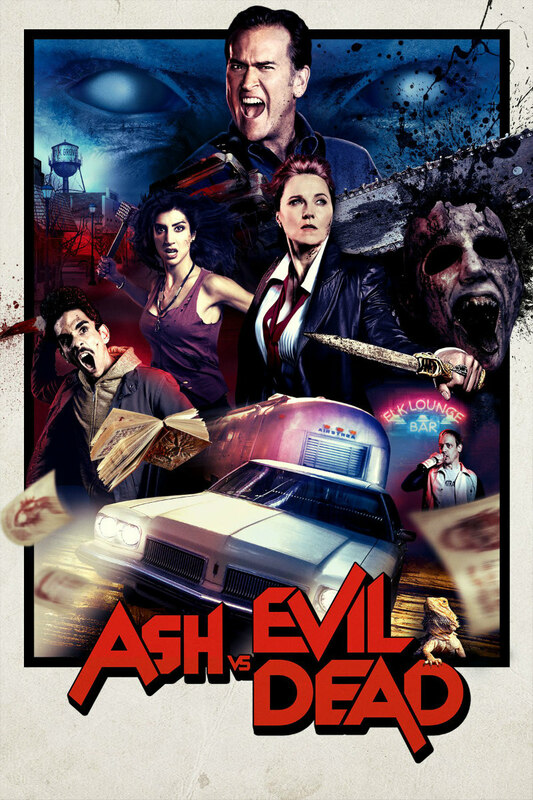 All in all, Ash Vs Evil Dead's sophomore season was a disappointing follow-up to its thrilling debut season. While it picked up mid-season in the Elk Grove set episodes, the season was bookended by some mediocre episodes. This season's main problem was that there simply wasn't a strong enough over-arching plot, and it failed to establish clear goals early on for its protagonists. Ash's dialogue was considerably flat in comparison to the witty scripts of the first season, while Ruby, Pablo and particularly Kelly were wasted, given little to do of note this time out. The same can be said of the new characters introduced; Lee Majors was perfectly cast as Ash's old man, but sadly under-used, while the dramatic potential of Ash's reunion with old flame Linda (Michelle Hurd) was squandered. A third season has already been greenlit, but if the show is to hold this viewer's interest, its writing needs to greatly improve. Some creative involvement from Sam Raimi would be very welcome.